Culturae Mundi is Celebrating Diwali! In association with CU’s Hindu society and the Bollywood Society, Culturae Mundi will be celebrating Diwali next week. Diwali, commonly known as the festival of lights, carries great spiritual significance for Hindus, Jains, Buddhists and Sikhs all over the world. It is usually observed for five days; we will be having a packed evening commemorating Diwali on Monday the 12th. 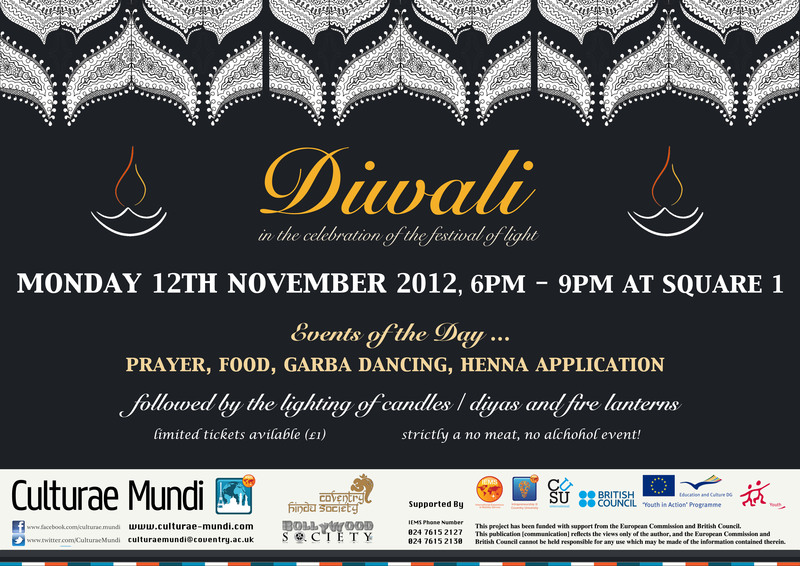 It promises to be a superb event with a great array of Bollywood music and dancing, candle lighting and fire lanterns. You can also expect a stand for artistic henna application and as well as some prayer. We will be topping it off with a great meal as well. It’s a night not to miss, right here on campus at Square One. Do join us for a wonderful evening starting at 6pm at Square One, Monday the 12th. We’ll see you there!